The International Diabetes Federation Europe youth leadership camp in Tirrenia, Italy was one of the best experiences I've ever had and where I had the idea of Blue Circle Diabetes Support Group. But whilst I very much enjoyed the camp I wanted to make sure that what I learnt and experienced could be shared when I returned back home to Wales. And to help make life a little bit easier for others with diabetes with what I had learnt. The initial concept I thought of, was that it would be all about the 'social' side of support. What I mean by this is that I'd witnessed the fact that time and time again, when people with diabetes came together, something awesome happens. We instantly find something to talk about in our shared experiences whether it's diabetes related or not. So I thought that if the support group met to do sociable informal things such as getting food together or going bowling, then the support would follow. I thought that every 6 weeks was a realistic amount of time to meet, with so many potential members being students or in full-time employment. With the core idea for the group set on, I needed to make sure it really helped the people I could give the best support to. Attending the Young Persons Project #YPP days for Diabetes UK saw a group aged between 18 - 30 meet up a deliver Family Support days. Being between 18 - 30 myself, and knowing the experiences I have and still am going through, the idea that the group could be aimed at people aged 18-30 was perfect. Attending some great support groups in the past for young children such as children's clinic; as well as some not so wonderful support groups for people much older than - it seemed both were great for the people involved and at the right age. Talking about this at #YPP made us realise that there was a 'gap in the market' for a support group that helped young professionals, students and adults. We realised there were key issues and rights of passage that were specific to this age group that only others the same age might really understand. And most importantly that we would be able to give support to. To be able to tell other people we knew, with diabetes about it we had to think of a name for the support group. After much consideration and brain storming I decided on the name Blue Circle Diabetes Support Group or BCDG for short. The reason why I chose this name was that the blue circle was my inspiration for the group. It has the meaning that it represents diabetes internationally, secondly blue is the colour that joins so many of the diabetes associations especially in the UK and the group is all about networking and joining together. And finally the circle itself represents a circle of trust and honesty which is fundamental for a support group where people can speak openly and not worry about judgement. Something else that I've learnt through my place in different diabetes groups in the UK and Europe. Finally, with the support group looking like it was going to become a reality it was time to think about getting some help, because when you break it down- creating a support group is a lot of work. So my first port of call was Mike - my neighbour and friend that I'd met at the young persons project #YPP days for Diabetes UK. We arranged the first meeting and recruited a couple of others and the group was born! 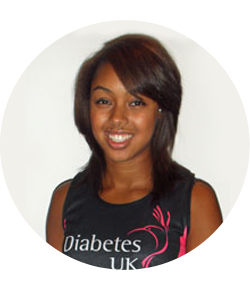 My name is Mel Stephenson, I'm 25 and have had Type 1 diabetes for the last 13 years. I've experienced both multiple daily injections and am now currently on an insulin pump. Despite being an international level athlete, my difficult times in diabetes came when I transitioned from injections to a pump. At the time I didn't know who to talk to and really would have benefitted from a group such as Blue Circle to have people to share experiences with, laugh about diabetes with and to know that I wasn't alone. I've had many positive experiences of diabetes and many of these have involved getting together with other people with the condition to volunteer and help others. And now this is something that I want to provide for other people.